“We know from talking to other victims and other agencies that girls are taken to truck stops and they’re actually traded,” she says, sitting in her car, a shiny silver sport utility vehicle. « Previous entryWhat's the role of faith in fighting slavery? May be it is aurelius 1947's fault and the do nothing Republican Congress. I hate to say it but I appreciate the do nothing congress. I have seen no worth-while legislation come out of them besides the STOCK act in at least the last six years. The last busy congress scared the businessmen and the investors. Only now have investors begun to stop waiting for the next curveball and are actually willing to put some of thier money on the line. The last time anyone in my family had enough money to invest in anything it was legal one year and illegal the next year and the IRS took them for everything they were worth. Thank God for those do nothing Republicans! Obama would have doubled the nat'l debt and gasoline would cost $6.00 a gallon by now! ...and we thought Bush was bad, ...yeah riiiight! Obama's out of control spending and his inflationary "O"bucks has caused food prices to jump to record highs too! The Dims want a two class system, with no middle-class. They long for those nostalgic Soviet Union days! :Wonderful goods from you, man. I have understand your stuff prvueois to and you are just extremely magnificent. I actually like what you've acquired here, certainly like what you're stating and the way in which you say it. You make it enjoyable and you still care for to keep it sensible. I cant wait to read much more from you. This is really a great web site. You mean our president is wrong and it's not Bush's fault! ...oh my! Good job lumping everyone together. This would be akin to lumping all atheists with Pol Pot, Mao Zedung, and Joseph Stalin. Good idea, that's where they belong. If we gave you atheists half a chance you would be placing Richard Dawkins as emperor. Atheism isn’t a religion or single school of thought. Your analogy only shows your ignorance. If you don’t like the Christian stereotype, change it. That’s best done by speaking to your fellow ‘believers’ an no arguing with Atheist. For the record your examples of Atheist is pretty poor. I suggest you do a lot more reading on those individuals. Sean; Perhaps atheism isn't a religion or a single line of thought, but people get tired of their double standards when they lump an anology together in comparison and expect to be respected! You have taken "faustus" statement out of context and that my friend is where people like yourself continue to fail! ...although you have to admit that Obama Care forcing religious organizations to participate in abortions and repugnant contraception practices is very "Stalinist" in theory! So much for the 1st amendment! ...sorry if you got your feelings hurt, but when you throw bricks at the other guys house, don't be mad if he's got more bricks than you do! In his book "The God Delusion" Dawkins fails to support debunked assertions, quotes out of context and shows a marked desire to escape moral accountability in any way, shape or form. In fact he relegates man to animal status. But the intellectually challenged wannabee philosophers love him! While you're lumping all the Christians together, why not associate all Muslims with terrorism or all pro athletes with greed or all Asians with bad driving? Your comment only shows that two different people who profess to have the same faith, have chosen two different ways to live it out. Nothing new or surprising in that at all. I had a cousin killed by an Asian driver, whats your point? All asians are bad drivers! My wife included! Jennifer is blind to the troubles in her backyard, as she can't contribute to help she is critizing those who care. Jennifer is one of those fat ugly broads who are ignored by men and is suffering rejection. What she needs more than anything is a good injection. I wonder if Jennifers injections are covered under Obama-care and how many more trillions it will cost those objectionable christians being forced to pay for it? ... Obama's not up to this task and Clinton is no where to be found! I hope you're not an American, because there are Americans who are murderers, rapists & human traffickers. Wait, are you those things!!? You're American, right, thereby based on your logic ... you're those things. People are hateful, biased, prejudicial, etc, etc ... regardless of religion, nationality, or race. That's people for you. And to lump all people in a single group as right, or better, or not those things, is being ignorant of truth & reality. The difference many of you are mission is the generalization effect. There are always exceptions, however they general rule applies to the majority. Education is tough for theist I know.. but how do you know you don’t like it if you haven’ tried it? Atheism is not a religion nor is it a belief. ...and why people dismiss you! Hi there! This is my 1st comment here so I just waetnd to give a quick shout out and tell you I truly enjoy reading your articles. Can you recommend any other blogs/websites/forums that deal with the same subjects? Thanks a lot! "jennifer" is actually a 55 year old, 300Lb, sweaty naked guy. Can't we all just get along? 우리 모두 사이 좋게 지낼 수 없어? If we listened to the pope, the sun would still revolve around the earth. Send in the Lions. 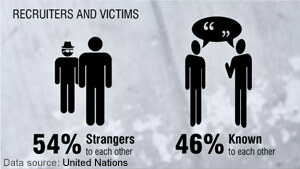 What are the Muslims doing world wide to fight social injustice? Or what are the Hindus doing? Freedom of religion in this country has turned into a cheap criticism towards Christianity. Finally, someone with a heart and a brain. I was scrolling down to see hoping to see someone who actually cares about another the human race. God, forgive us for what we have become. You are confusing the myth of western Christianity with the reality. (Seems to be a habit of theists) For those ‘Christians’ who believe your religion is superior to others or about ‘love’ I suggest you read your own bible. You can WANT it to be all you like…doesn’t change your track record or scripture. ...and it doesn't change your statists-socialists like Hitler, Mao and Stalins record either! ...look what they accomplished for humanity! Steven Weinburg – religion is not 'an insult to human dignity", religion is whatever you want to make it. Those that do believe (and there is a sliding scale of amount of belief) do so because they want to, not because someone told them to at least not in the Western nations of the world. Good people do bad things all the time, and bad people do good things all the time. You have to really narrow down what you mean by 'good and bad'. Steven – That isn't your best attempt! China, North Korea, and Russia abandoned Religion and look at their human rights records. In mainly Muslim countries it is almost as bad. But in countries where there is a broadly Christian base things are so much better all round. There is a BIG difference between 'religion'..........and, 'spiritual'. "Religion" is controlling.............."Spiritual" is setting-free. "Religion" produces fear.............."Spiritual" sets us free to LOVE! And, LOVE changes everything. GOD is LOVE! I am a practising Catholic and I try to live my faith. I don't find it constricting in the slightest becaise I love God [ more than I love myself,] and I love my fellow men. When people baspheme on some of these posts, I get really mad , not because they're unloveable, but because they are insulting and disrespectful and I absolutely refuse to accept it. Generalizations don't usually work in any discussion. It is the burden of White Christian men to save the women of the world. Great work! In this place women are being exploited in a truck stop. In non christian untrue faiths, women are victims of exploitation in every home. Jesus wants Christian men to save these women, and this will also help in planting the True Christian Faith in the hearts of their future progeny through Christian men of the US Evangelical Churches, and in harvesting their souls for Jesus rather than letting their souls rot as anti Jesus untrue Faith people. At any point these women could walk over to a policeman (often seen at truck stops) or inside to an employee to call the police. Fact is these women chose to stay where they are. There is no slavery here. Stop trying to ‘save’ those who don’t want to be saved. You look pathetic. 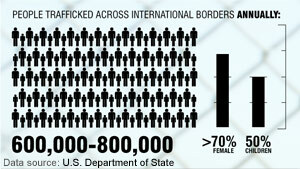 The Polaris Project has always been a fore-runner in the fight against modern-day slavery. Amazing results when various organizations and law enforcement work together. Putting one's personal faith aside... keep those mountains moving! America is 5% of the world population black men in the us. Make up .003 of the world population but make up 12% of the worlds prison population how can american cgristians have the nerve to talk about world slavery when there still practicing it at home? :It was my contentment cimnog across your site a short while ago. I arrived here just now hoping to find out interesting things. I was not disappointed. Your ideas for new methods on this subject material were useful and a terrific help to my family. Thank you for leaving out time to write down these things plus for sharing your thoughts. Repent and ask God to forgive your sins and accept Jesus as your Lord and savior. Until you do that, you are a slave to your own sinful nature. If you are offended by this or have doubts, ask God to reveal himself to you and be willing to accept what he shows you about yourself and about His nature. The world is in a tail spin to the point no man or earthly human can fix it ! its the last days as we see with these weather problems showing us the signs, if you read the bible you'll know we have nothing to worry about. God is now in charge and always will be. These things will come to pass ! pray for your families safety and to be provided for and live a clean life! The question here "was" What's the role of faith in fighting slavery? – What's so difficult with sticking with the subject at hand? This topic has been hijacked and by mostly ignorant people with unpatriotic, rude, untruthful comments about our President. Now, if you can say something about faith in fighting slavery, that would be a start. Faith is positive energy and regardless of what religion you are, any group that can do anything to undo the wrongdoings of others, is a good thing. Why is everyone wasting time arguing and bashing Christians? That's not even what this article was focused on. 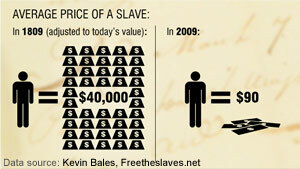 We should be discussing the 27 million inncoent people enslaved. 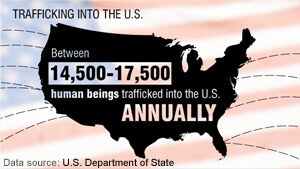 We should be raising awareness and taking action to end human trafficking.